As we’ve told you before, there are a lot of exciting independent bands that rock Chicago on a nightly basis. And tonight at The Hideout Johnny Rumble and The Kickback will doing their best to help melt away the memory of yesterday’s massive blizzard that turned the Midwest upside down and shook us up like a big super-sized snow globe. First up, is a quick reminder of our previous interview with the one of tonight’s openers Kickback. Check it out to discover why they’re ready to explode and how Iggy Pop and The Stooges inspires their live show. 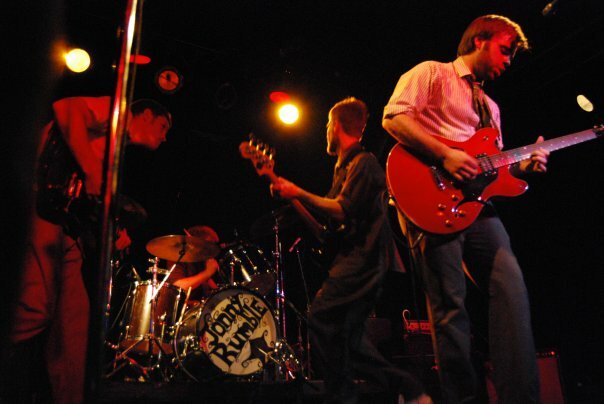 Okay, now it’s time to get to know the headliners power-pop quartet Jonny Rumble. [Patrick] played a show in Miami the day of his release with bloody bandages wrapped around his right foot. To help soothe the pain the bar played CCR all night in between bands. Patrick spent three days in Cook County Jail when he was mistakenly picked up after a show in Logan Square for an erroneous bench warrant. Brian had to spend the night in the Kalamazoo city jail for a college house party that simply grew out of control. During a show in Chicago, Seth lost a tooth when he broke a drumstick hitting a symbol. A piece of the stick hit him in the mouth and knocked one of his front teeth out. Those accounts are quite entertaining and I hope I get to know more about how those crazy moments forever altered and evolved the band’s approached to rocking a live crowd. And to get you ready for the show, Brian told us about what he loves the most about playing in Chicago, what he would change about the meaning of live music, why he listens closely to the audience at show, and why he hasn’t bought a $65 concert ticket in a long long time. 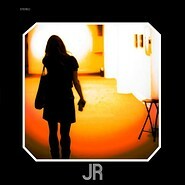 LF: How have your live shows influenced and inspired the recording of your latest album JR? Brian Webb: Well I think we really tried to stick to what we could reproduce live while we recorded this last record. I think the song order reflects that of a live show to. Lots of ups and downs dynamically as well. The record it pretty layered instrumentally but while making it I think we all kept the idea of playing it live in our heads somewhere. Little things at a show…. As an artist actually playing the show I think its a little different. I always try to listen. I listen to the response of the audience definitely. How they respond to pieces of the show….what gets them off I guess. Also the chatter sometimes in between songs can be funny. You hear lots of funny stuff up there… Drunken chatter, Guys hitting on gals, ya know. I do often notice quite a diversified audience too, all types of people at the show. That in itself can be pretty uplifting, I have never wanted to appeal to a specific audience or be labeled as any specific genre. Seeing that Diversity in our audience gives me reassurance that we are succeeding in that area. As a fan also I think this can be different. I can get really sucked into a show, it’s hard for me to turn off the musician part of myself. I really like watching drummers and rhythm guitar players. Never been really into flashy guitar playing. I like simple and thoughtful guitar playing, the kind of stuff that just makes a song work. I find that people like simple. I am kind of an equipment junkie too, I love checking out what people are using instrument-wise. It can give me ideas down the road while writing or recording. What was your first live concert like as an artist and what did you learn from it? The first show we played as a band was a battle of the bands in Detroit, I think we came in second…. It was really bad probably as I remember only really having a day or two to prepare. Seth, our drummer and my kid brother, was still in High school at the time and lives 200 miles from the rest of us. But I do definitely remember feeling like we had something here. Seth and I (Brian) have been playing together since grade school, I think always looking for the guys that really felt right. Jeremy and Pat really felt right and that show was when we all realized that I think. I think personally I would have to say Radiohead. They are so good at getting all those layers, sounds, and emotions out of their live songs. And they do it all without adding musicians. I would love to have the patience to do that. White Rabbits would be a close second for much of the same reason, only on a smaller scale. Maybe even more so because it is more attainable from where we are as a band. What I would change would probably be the overall meaning of live music to the public. I think the music scene in a lot of places is so over-saturated that people almost get turned off. It has become somewhat taken for granted I think. It really used to be that a concert was really something to talk about. The 70’s music scene in Detroit is a great example. There were basically 2 or 3 medium sized venues that competed heavily for the attendance of the cities music fans. Nowadays the venues don’t do that, they don’t promote the bands, they just book them and it’s up to the artist to do the rest. It creates this whole viscous cycle of bands that may not necessarily be that good or popular, they just have a lot of friends that they bring out to the show so the venue will book them. Back in the day the venues in Detroit WANTED to be known for having the best damn bands in the city. The promoters would get the people there and the bands job was to put on a killer show, make ’em stay, and have fun. People would go to a venue because they knew the place always had something cool happening. It was this over-saturation that killed the scene there… and of course money. I think people may not realize that I can’t see them. The lights are usually quite blinding, I have no idea who is watching or how many people are watching. I just listen to them because I can’t see them. I’m sure that is not a unique thing, though. I guess the fact that we use a lot of harmony, all four of us sing. And I’m not saying that we are the only ones that do this, but it is becoming a bit of a lost art. Any thing else you’d like to share about your live performance or some of your favorite concert experiences? I really want to tell people how great the scene in Chicago really is. There are indeed A LOT of bands, and you really have to sift through, but you can find some great original music here. Screw all these cover bands and Tribute bands. There are quite a few bands here in the city that write some GREAT music. And so many of them just give it away to people just to be heard or get you to come out to a show. Theoretically people could fill their iPods with great original music from Chicago, as long as they can get over the fact that it may not be on the radio or headlining Lollapalooza, or selling half a million downloads a day with corporate snobs shoving it down peoples throats. I have not bought a $65 concert ticket in years and I don’t miss it. I see plenty of great shows here in the city at a fraction of the cost, people like Mike Musikanto, Curtis Evans and our friends Electric, Inchworm, Oh My God, The Lifeline, The M’s, Skybox, California Wives, Bailiff, and alot more. These guys have put on shows that have left me totally fulfilled and inspired to keep doing what we are doing, and every little cent you spend seeing them or downloading their music actually goes to that artist and makes it possible for them to get up and do it for another day. These are true artists that live, eat, and breathe music. They are artist that are accessible, they will talk to you like a real person and drink with you. The industry needs to be overthrown and restructured, they don’t need your support. I know it sounds like I am ranting but I truly believe that music is at a crossroads and has been for years. Independent music is yours… Embrace it and keep it away from the swine. Thanks again to Brian and the band for taking the time to share their concert stories and live show experiences! If you have any questions for Brian or thoughts on the interview or want to tell us about a Jonny Rumble live experience that we can add to our other concert fan stories, go ahead and share them in the comments below.